A Askalani, H Meabid, Saad El Sadek M El Sadek, Nabil M El Tabbakh, M Osman. A Monoclonal Antibody Quantitative Measurement And Immunohistochemical Localisation Of Carcinoembryonic Antigen In Ovarian Neoplasia. The Internet Journal of Gynecology and Obstetrics. 2001 Volume 1 Number 2. Objective: To evaluate the significance of including CEA in serum and tissues in the management protocol of patients with ovarian malignancies. Patients And Methods: The study included 68 patients which was divided into three groups. Group [A] included 21 patients with malignant ovarian tumors. Group included three patients with boderline ovarian tumors. Group [C] included eight patients with benign ovarian tumors, Group [D] included 36 women without any apparent gynaecologic disorder ( control group). Serum level of CEA was measured in all patients in group A, B and C prior to treatment and at least 12 weeks following therapy. Formalin - fixed and paraffin - embedded tissue blocks taken from 2 different sites of the studied lesions were prepared. Immunohistochemical staining for CEA was performed for the studied tissues. Results: All the ovarian tumors investigated in this work were of epithelial origin. All benign and borderline ovarian tumors had negative pre- and post-treatment serum CEA levels (< 5ng/ml) and were negative for CEA tissue stain.85.71% of ovarian serous cystadenocarcinomas had negative pre-treatment serum levels . All the squamous cell carcinomas and 66.67% of each of mucinous cystadenocarcinomas and undifferentiated carcinomas had positive (>=5ng/ml) pre-treatment serum levels. After treatment the different histological types of ovarian carcinimas were seronegative for CEA.The highest percentage of positive staining (100%) was found in squamous cell carcinomas [50% (+1) and 50% (+3)], followed by 66.67% of mucinous cystadenocarcinomasThe mean difference between pre-and post-treatment serum CEA was significant in mucinous cystadinocarcinoma with negative and positive tissue reaction and in negatively stained serous cystadinomacarcinoma.The percentages of cases of ovarian carcinomas with positive pre-treatment serum CEA increased with the increase of grade of malignancy from 33.33% in G1 to 55.56% in G II and 66.67% in GIII.No definite relation could be detected between the grade of malignancy and the intensity (degree) of reaction of malignant ovarian tumors to CEA immunostaining.The percentage of cases with positive pre-treatment levels of serum CEA increased progressively with the advance in clinical staging. The incidence was 37.5% in stage I, 55.56% in stage II, 66.67% in stage III, and 100% in stage IV. No definite relation could be detected between the clinical stages and the degree of reaction of ovarian carcinomas to CEA tissue stain. Conclusion: This study indicated that immunohistochemical identification of CEA in tumor tissue and of monoclonal antibodies quantitative measurement of CEA in human serum is a useful adjunct in the management protocol of patients with ovarian malignancies. However further studies are required to fully ascertain the usefullness of this technique. Ovarian cancer is a serious and silent disease and has high rate of mortality among malignant gynecologic tumor. It is typically diagnosed at an advanced stage(1,2,3). Furthermore, even when small ovarian tumors are considered to be resected , there is a recurrence in at least one-third of the patients(2,3,4,5). Unfortunately, despite advances in surgical technique and novel chemotherapeutic agents, survival rates have not improved significantly over past 25 years(2,6). In this work we try through the study of CEA in the serum and tissues to evaluate the significance of including this tumor marker in the management protocol of patients with ovarian malignancies. Group [A] : Included 21 patients with malignant ovarian tumors, including mucinous cystadenocarcinoma (9 cases) ; serous cystadenocarcinoma (7 cases), unidifferentiated carcinoma (3 cases) and squamous cell carcinoma(2 cases). Group : Included three patients with boderline ovarian tumors, two of them were boderline mucinous tumor and the third was of the serous type. Group [C]Included Eight patients with benign ovarian tumors, four were mucinous cystadenomas and the other four were serous cystadenomas. Clinical staging for malignant lesions in group A according to the International Federation of Gynaecology and Obstetrics (FIGO) staging systems (9). Staging of ovarian cancer showed 8 patients with stage I, 9 patients with stage II, 3 patients with stage III and one patient with stage IV. Serum samples were collected from the patients in groupa A, B and C prior to treatment and at least 12 weeks following surgery or completion of radio or chemotherapy. All the patients were clinically free at the time of the post-treatment sample proved by a second look laparoscopy. 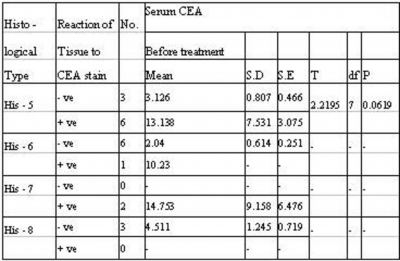 serum CEA was assayed in all the serum samples using a monoclonal antibody based immunoassay commercially available kit from Abbott Laboratories (North Chicago, Illinois, USA,) which provides a quantitative measurement of CEA in human serum. It is a solid phase enzyme-linked immunosorbent assay based on sandwich principle. 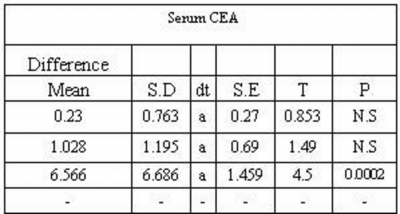 A positive result for CEA in serum was taken as 5 ng/ml or more. Surgical specimens from ovarian tumors-taken from two different sites-were fixed in 10% formalin and embedded in paraffin. Formalin fixed, paraffin - embedded tissue blocks with hematoxylin-eosin stained slides had been prepared for all cases without special processing for determination of histological type, the degree of tumor differentiation and for selection of blocks for study. Serial sections not more than 5 um thick were deparaffinized in xylene and dehydrated in a series of graded concentrations of alcohol. The slides were incubated in methanol with 0.3% hydrogen peroxide to eliminate endogenous peroxidase activity.After incubation with polyclonal rabbit primary antibody for 60 minutes and with polyclonal enzyme for another 60 minutes at room temperature,the specimens were stained by the DAB (diaminobenzidine) working colour reagent and incubated for 5-10 minutes and counterstained with haematoxylin for for 30-60 seconds. Grade 1: well differentiated tumors (G1). Grade 2: moderately differentiated tumors (G 2). Grade 3: poorly differentiated tumors (G 3). (0) Denoting negative reaction i.e. showing no difference from the control sections. (+1)	Means that up to 25% of the cells were positive. (+3) Means that >50 - 75% of the cells were positive. (+4) Means that >75% of the cells were positive. The patients with malignant ovarian tumors were treated with surgery alone or combined with radiation therapy or chemotherapy depending upon primary type, histologic differentiation and stage of disease. Those with non malignant lesions were treated only surgically. Statistical analysis was carried out using an IBM - AT computer and SAS program (SAS, 1988). One way analysis of variance (procedure GLM of SAS ) followed by Duncan's multiple range test were used to test the significance between the different variables studied. Paired t-test (procedure Means of SAS ) was run to test the significance of the difference in serum CEA levels in relation to the variables studied in the current investigations, while student's t - test ( procedure test of SAS) was employed to test the significance of change in serum CEA levels between negatively and positively stained lesions in relation to the different variables investigated. 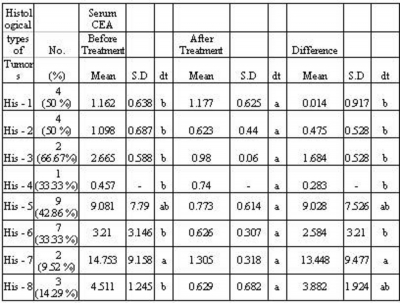 Cross tabulation and chi - square test (procedure frequency of SAS ) were used to obtain and compare the percentage distribution of the studied cases according to their serum CEA levels and reactions to CEA immunostaining in relation to the studied variables. The probability level 0.05 (p = 0.05) was used to test the significance of the previous tests. All the ovarian tumors (benign, borderline and malignant) investigated in this work were of epithelial origin, half of the benign ovarian tumors were mucinous cystadenomas while the other half were of serous type. In the borderline group of tumors, 66.67% were borderline mucinous tumors and 33.33% were borderline serous ones. The percentages of the different histological types of ovarian carcinomas were as follows: 42.86% mucinous cystadenocarcinomas, 33.33% serous cystadenocarcinomas, 14.29% undifferentiated carcinomas, and 9.52% squamous cell carcinomas. 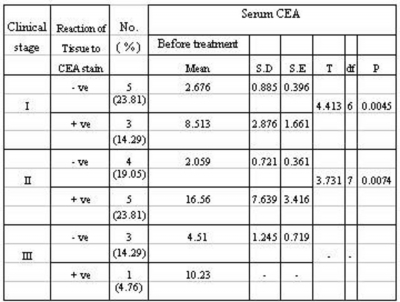 Table (Ib) : Serum CEA before and after treatment in different types of ovarian tumors. The different histological types of benign and borderline tumors were negative for CEA tissue stain. The negatively stained malignant ovarian tumors included all undifferentiated carcinomas, 85.71% of serous cystadenocarcinomas, and 33.33% of mucinous cystadenocarcinomas. On the other hand, the highest percentage of positive staining (100%) was found in squamous cell carcinomas [50% (+1) and 50% (+3)], followed by 66.67% of mucinous cystadenocarcinomas distributed as 55.56% in (+1) and 11.11% in (+3). 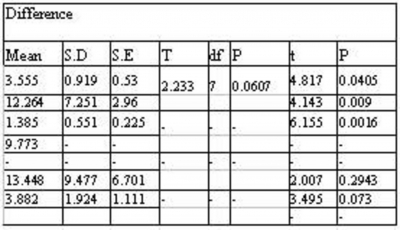 The lowest percentage of positive reaction (14.29%) for CEA was found in serous cystadenocarcinomas, all the cases belonged to (+1) degree of reaction (Table II). As shown in table (II), mucinous cystadenocarcinomas were the only group of malignant ovarian tumors with a number of positively and negatively stained cases suitable for comparison of serum levels. However, all the serum levels of CEA pre-, post-, and difference for this histological type of ovarian malignancy showed no significant difference between the positively and negatively stained cases. The mean difference between pre-and post-treatment serum CEA was significant in mucinous cystadenocarcinoma with negative and positive tissue reaction and in negatively stained serous cystadinomacarcinoma. The percentages of cases of ovarian carcinomas with positive pre-treatment serum CEA increased with the increase of grade of malignancy from 33.33% in G1 to 55.56% in G II and 66.67% in G III. After treatment the serum CEA levels of all the cases were within the negative range (< 5 ng/ml). The mean serum CEA before and after treatment and the mean difference in serum levels showed no significant change on comparing the three histological grades of malignancy. No definite relation could be detected between the grade of malignancy and the intensity (degree) of reaction of malignant ovarian tumors to CEA immunostaining. The mean pre-treatment serum CEA levels were significantly higher in positively stained tumor in comparison with the negative ones in each grade of malignancy. The mean difference in serum CEA levels was significantly higher in positively stained tumors in comparison with the negative ones in each grade of malignancy (Table III). The percentage of cases with positive pre-treatment levels of serum CEA increased progressively with the advance in clinical staging. The incidence was 37.5% in stage I, 55.56% in stage II, 66.67% in stage III, and 100% in stage IV. However, the serum levels of all the cases were negative after treatment. No definite relation could be detected between the clinical stages and the degree of reaction of ovarian carcinomas to CEA tissue stain. The mean pre-treatment serum CEA levels were significantly higher in positively stained ovarian carcinomas in comparison with the negatively stained ones in clinical stage I and II. As for stage III the small number of positively stained tumors did not allow such a comparison. The mean serum CEA levels after treatment showed no significant difference in relation to tissue staining of ovarian carcinomas in the different clinical stages. The mean difference in serum CEA levels, was significantly higher in positively stained ovarian carcinomas in comparison with the negatively stained ones in clinical stages I and II. The mean difference in serum CEA levels were significant in the positively and negatively stained malignant ovarian tumors in stages I and II. The results were insignificant in stage III. From the data of the present study, CEA is more efficient in mucinous than in serous cystadenocarcinoma, while in benign tumors showed very low sensitivety. CEA was most frequently detected in mucinous tumors(10) .Inoue et al(11) , found positive pre-treatment serum CEA in 21.42% of the cases of serous cystadenocarcinomas (cut-off level 2.5 ng/ml),while Kazuya et al(12) noted positive immunostaining in 13.8 % of serous cystadenocarcinoma and in 46.2 % of mucinous cystadenocarcinoma .Motoyama et al(13) and Phocas I(3) , using a technique of serum assay different from ours did not detect positive serum CEA levels (> 2.5 ng/ml) in any of the studied serous adenocarcinomas,and noted positive pre-treatment serum CEA (> 2.5 ng/ml) in 42.85% and 30.8% respectively of the cases of mucinous cystadenocarcinomas. While the incidence of Inoue et al. (11) , was 22.58% (using our method of serum assay but a lower cut-off level 2.5 ng/ml). The benign and borderline ovarian tumors in this study were negative for CEA tissue stain. Previous investigators have evaluated the distribution of CEA in ovarian epithelial neoplasia, all of whom reported positive staining in many cases, particularly in mucinous tumors. (3, 10. 11, 12, 13, 16) .Rutanen et al. (17), reported positive staining of serous ovarian tumors in about 12% of the cases. Negative tissue stain of benign serous ovarian tumors was found by previous investigators(10,13), but they used a different method of tissue staining. However, Tohya et al. (18) and Neunteufel and Breitenecker (19) , using our technique of immunostain, did not also detect positive reaction among benign serous ovarian tumors. Positive staining of benign mucinous ovarian tumors was noted by previous investigators(10,13,17) . In this study the highest percentage of positive staining in malignant ovarian tumors was found in squamous cell carcinomas (100%), followed by mucinous cystadenocarcinomas (66.7%), and finally serous cystadenocarcinomas (14.3%). The frequency of positive staining of mucinous ovarian carcinomas showed wide variation in the literatures. A great variability was also observed in the incidence of serous ovarian carcinomas showing positive reaction for CEA tissue staining. Previous authors used polyclonal antiserum , founded that all serous ovarian carcinomas had a negative reaction (18,24) . While Neunteufel and Breitenecker (19) and Dabbs and Geisinger (25) , reported 21% and 52% as incidences of positivity respectively. On the other hand, charpin et al. (10) , Motoyama et al. (13) and Hummond et al. (22) , using monoclonal antiserum in their techniques found positive cases of serous ovarian carcinomas in 0%, 0% and 24% of their studied groups respectively. As regards undifferentiated carcinomas the results of the present study were consistent with the findings of Hammond et al. (22) , (using monoclonal antiserum). and Fleuren and Nap (26) , (using polyclonal antiserum). Dietel et al. (27) , attributed these wide variations in results to the differences in antisera applied (mono or polyclonal), absorption procedures used for antiserum purification, and antiserum dilutions used for immunoassay (27). Two degrees of positivity of staining were detected among ovarian carcinomas in the current study. Casper et al. (28) , showed that positively stained serous and mucinous carcinomas were distributed only between 2 levels of positivity but their grading system for positive reaction was different from that used in the present study. Motoyama et al. (13) , noted positive staining reaction in mucinous ovarian carcinomas only not in the serous ones. They used 3 levels of positivity for grading of tissue reaction. The positively stained mucinous lesions were distributed between the 3 levels but the main bluk (82% of the cases) were in the first level. However, it should be noted that their technique of immunostaining and the system of grading of tissue reaction were different from those of our research (13). Charpin et al. (10) , using the same grading system of our study, found that positively stained mucinous ovarian carcinomas were distributed between 3 levels of positivity mainly in (+ 2) level (67% of cases), but they used monoclonal antisera for tissue staining. A relation could be observed in the current investigation between pre-treatment serum levels of CEA and the reaction of tissues to CEA immunostaining in malignant ovarian tumors. These results are consistent with the findings of Motoyama et al. (13) , as they considered that immunohistochemical identification of a marker in tumor tissue is a pre-requisite to the use of that marker in the serum to monitor disease status. The only exception to this finding is the undifferentiated carcinomas because all of them were negative for CEA immunostaining but 66.67% of the cases had positive serum levels. McDicken and Rainey (29), found that in the lesions with more undifferentiated cell forms CEA may be masked and difficult to be demonstrated immunohistochemically. They recommended pre-treatment of tissues with trypsin to facilitate exposure of cellular antigens. This finding may explain the apparent controversy shown before in undifferentiated carcinomas. So generally we can assume that no definite relation could be proved between the histological grade of malignancy and the intensity of staining reaction in the present study. Breiteneckere et al. (31) and Tholander et al (32) using the same technique of immunostaining could not also find a relation between these 2 variables. The percentage of cases with positive pre-treatment levels increased progressively with the advance in clinical staging. (Table IV). These results are consistent with the findings of Motoyama et al. (13) and Magon et al. (33) , found an elevated pre-treatment serum CEA levels in 16.67% of the patients with stage I disease, the incidence increased to 38.89% in those with stage III, but all the cases with stage II disease were seronegative for CEA as the majority of them were of the serous type which is not usually associated with a high incidence of elevated serum CEA. Tholander et al. (32) , showed elevated serum CEA values in 53% of the patients with limited disease (stage I and Iia) and in 20% of those with extensive disease (stage IIb, III and IV), but they used a different technique of serum assay (polyclonal rabbit antiserum) and the majority of their cases (86.6%) were non mucinous carcinomas. Massi et al. (34) , reported a decreased incidence of elevated serum CEA with advance of the disease stage, but most of their cases were of the serous and undifferentiated types. Kazuya et al(12) reported that CEA level was not correlated with the clinical stage suggesting that this tumor marker may be more useful in screening for early stage disease. The positively stained malignant ovarian tumors in the different clinical stage were distributed between 2 levels of positivity (+1) and (+3). No specific relation could be found between clinical staging and degree of tissue staining in the current work. The same finding was also observed by Motoyama et al. (13) . 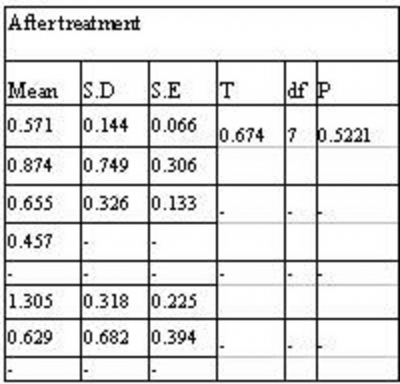 On comparing the mean values of pre-and post-treatment serum CEA and the mean difference between them in the different clinical stages, no statictically significant difference can be detected between them as shown in table (IV). These results are comparable to those of Tholander et al. (32) and Koh and Cauchi (35) . All of them observed no correlation between the absolute level of the marker and stage of the disease in positive serum cases. Several factors were shown to affect the serum and tissue levels of CEA ,e.g histological type of tumors ,grade of malignancy ,clinical stage of disease, technique of serum assay and tissue staining and the cut-off level of CEA in serum. These factors must be put in consideration before evaluating the results of CEA assay. In conclusion this study indicates that immuno-histochemical identification of CEA in tumor tissue and of monoclonal antibodies quantitative measurement of CEA in human serum is a useful adjunct in the management protocol of patients with ovarian malignancies. However further studies are required to fully ascertain the usefulness of this technique. 1. Alberico S., Facca M C., Millo R., Radillo L., Mandruzzato G P : Tumor markers (CA 125-CEA) in the screening of ovarian cancer. Eur J Gynecol Oncol. 1988 ,9(6):485-9. 3. Phocas I., Sarandakou A., Sikiotis K., Rizos D., Kalambokis D., Zourlas P A.:A comparative study of serum a-BA Immunoreactive inhibin and tumor associated antigen CA 125 and CEA in ovarian cancer. Anticancer Research 1996,16:3827-32. 4. Crandon A. J : The assessment of ovarian masses. J. MODERN MEDICINE of the Middle East (1996) Vol. 13 No. (4) April p: 80 -87. 5. Von Gruenigen V E; Muller C Y; Miller DS; Mathis J M: Applying gene therapy to ovarian cancer. J. OB / GYNAECOLOGY TODAY (1997) Vol I No. 2 p 24 - 30. 6. Kraly J and Wawrzkiewicz M : Evaluation of diagnostic usefulness of CEA, HCG and SCC antigens in cervical cancer patient's. Eur. J. Gynecol. Oncol (1989) IO (5) : 319 - 322. 7. Ballesta AM; Molina R; Filella X; JO J; Gimenez N : Carcinoembryonic antigen in staging and follow up of patients with solid tumors. Tumor Biol. (1995) 16 (1) : 32 - 41. 8. Juweid N., Swayne L C., Sharkey R M ,et al rospects of radioimmunoassay therapy in epithelial ovarian cancer :results with iodine-labeled murine and humarized MN-14 anti-carcinoembryonic antigen monoclonal antibodies. Gynecol Oncol. 1997; 67(3):259-71. 9. Pecorelli S; Odicino F; Maisonneuve P; et al : FIGO Staging of Gynecologic cancer : Carcinoma of the ovary. FIGO website http://www.figo.org.default.asp?id= 39, 40 & 41. (1998). p 1- 3. 10. Charpin C; Bhan A.K; Zurawski V. R and Scully R.E : Carcinoembryonic antigen (CEA) and Carbohydrate determinant 19 - 9 (CA 19 - 9) Localization in 121 primary and metastatic ovarian tumors : An Immunohistochemical study with the use of monoclonal antibodies. Int. J. Gynaecol. pathol. (1982) : 1 (3) : 231 - 245. 11. Inoue M; Fujita M; Nakazawa A; Ogawa H; and Tanizawa O : Sialyl - Tn; Sialyl - Lewis Xi; CA 19 -9; CA 125; Carcinoembryonic antigen and tissue polypeptide antigen in differentiating ovarian cancer from benign tumors. Obstet Gynecol 1992 Mar; 79 (3) : 434 - 40. 12. Kazuya K.,Yoshihiro K.,Tsunekazu K:Preoperative determination of several serum tumor markers in patients with primary epithelial ovarian carcinoma. Gynecol Obstet Invest. 1999; 47:52-57. 13. Motoyama T; Watanabe H; Takeuchi S; Watanabe T; Gotoh S; and Okazaki E : Cancer antigen 125. Carcinoembryonic antigen and carbohydrate determinant 19 -9 in ovarian tumors. Cancer (1990) 66 : 2628 - 2635. 14. Stall K. E and Martin EW : Plasma Carcinoembryonic antigen levels in ovarian cancer patients. A chart review and survay of published date. J. Reprod. Med. (1981), 26 (2) : 73 - 79. 15. Oishi T.,Maruo T.,Iwasaki M.,Mochizuki M.,Relationship between serum levels and immunohistological tissue levels of CA 125 and CEA in epithelial ovarian cancers:its implications for tumor cell type specificity. Nippon Sanka Fujinka Gakkai Zasshi. 1986; 38(9):1595-604. 16. Rutgers J L and Bell D A.,:Immunohistochemical characterization of ovarian borderline tumors of intestinal and mullerian types.Mod Pathol. 1992, 5:367-371. 17. Rutanen E M.,Lidgren J.,Sipponen P et al :Carcinoembryonic antigen in malignant and non malignant gynecologic tumors,circulating levels and tissue localization. Cancer 1978 ,42:581-590. 18. Tohya T; Iwamasa T; and Maeyama M : Biochemical and Immunohistochemical studies on Carcinoembryonic antigen of ovarian mucinous and serous tumors. Gynecol. Oncol. (1986); 23 : 291 - 303. 19. Neunteufel W and Britenecker G : Tissue expression of CA 125 in benign and malignant lesions of ovary and fallopian tube : A comparison with CA 19 -9 and CEA. Gynaecol. Oncol. (1989); 32 : 297 - 302. 20. Van Nagell J R.,Donaldson E S.,Gay E C, et al :Carcinoembryonic antigen in ovarian epithelial cystadenocarcinomas,the prognostic value of tumor and serial plasma determinations . Cancer ,1978; 41:2335-2340. 22. Hammond R, Bastes T D , Clarke D G et al :The immunoperoxidase localization of tumor markers in ovarian cancer: the value of CEA, EMA, Cytokeratin ,and DD9 . 1991;98:73-83. 23. Lui A ,Wang M ,Li H .:An immunohistochemical study of intestinal antigens and CEA in ovarian epithelial tumors.Chung Hua Ping Li Hsueh Tsa Chih , 1995;24 (6):366-8. 24. De Boer W G and Nayman J :Intestinal -associated antigens in ovarian tumors :An immunohistological study. Pathology ,1981,13:547-555. 26. Fleuren G J and Nap M :Carcinoembryonic antigen in primary and metastatic ovarian tumors. Gynecologic oncol. 1988,30:407-415. 27. Dietel M; Holzel F; Orto P; Niendrof A; Arps H; Viale G and Kroger A : Blood group substances, CEA and Lectins in ovarian tumors. Cancer Detection and Prevention (1986), 9 : 511 - 520. 28. Casper S ,Van Nagell J R ,Powell D F et al :Immunocytochemical localization of tumor markers in epithelial ovarian cancer. Am. J . Obstet.Gynecol.1984,149 :154-158. 29. McDicken I W and Rainey M : The immunohistological demonstration of carcinoembryonic antigen in intraepithelial and invasive squamous carcinoma of the cervix . Histopathology ,1983, 7:475-485. 30. Khoo S K and Mackay E V .:Carcinoembryonic antigen (CEA) in ovarian cancer :factors influencing its incidence and changes which occur in response to cytotoxic drugs. Br J Obstet Gynecol ,1976 , 83(10) :753-759. 31. Breitenecker C , Neunteufel W ,Bieglmayer C , Kolbl H , Schieder K: Comparison between tissue and serum content of CA 125, CA 19-9 and carcinoembryonic antigen in ovarian tumors . Int J Gynecol Pathol . 1989 ,8 (2) :97-102. 32. Tholander B; Taube A; Lindgren A; SjobergMO; Stendahl U; and Tamsen L : Pre-treatment serum levels of CA 125, Carcinoembryonic antigen, tissue polypeptide with ovarian carcinoma : Influence of histological type, grade of differentiation, and clinical stage of disease. Gynecologic Oncology (1990), 39 : 26 - 33. 33. Magon H ,Daunter B ,Khoo S K, Mackay E V.:A comparison of two radioimmunoassay methods for the detection of carcinoembryonic antigen in patients with ovarian or cervical cancer. Gynecologic Oncology, 1981,11 :340-347. 34. Massi G B ,Amunni G ,Tommasi M , Bonazza M ,Ciardetti P , Cappelli G.:The significance of measurement of several oncofoetal antigens in diagnosis and management of epithelial ovarian tumors.Eur J Gynecol Oncol., 1983 ,4(2):88-93. 35. Koh S K and Cauchi M N. rognostic significance of oncofoetal antigens in patients with ovarian cancer. Aust N Z J Obstet. Gynecol. 1983, 23:69-72.